Mycophenolate mofetil is a white to off-white crystalline powder. It is slightly soluble in water (43 mcg/mL at pH 7.4); the solubility increases in acidic medium (4.27 mg/mL at pH 3.6). It is freely soluble in acetone, soluble in methanol, and sparingly soluble in ethanol. The apparent partition coefficient in 1-octanol/water (pH 7.4) buffer solution is 238. The pKa values for mycophenolate mofetil are 5.6 for the morpholino group and 8.5 for the phenolic group. Mycophenolate mofetil is available for oral administration as capsules containing 250 mg of mycophenolate mofetil, and tablets containing 500 mg of mycophenolate mofetil. Inactive ingredients in mycophenolate mofetil 250 mg capsules include croscarmellose sodium, pregelatinized starch, povidone (K-90), isopropyl alcohol, and magnesium stearate. The capsule shells contain gelatin, sodium lauryl sulphate, FD&C blue 2, red iron oxide, yellow iron oxide, and titanium dioxide. The capsule is printed with edible black ink comprised of shellac, dehydrated alcohol, isopropyl alcohol, butyl alcohol, propylene glycol, strong ammonia solution, black iron oxide, and potassium hydroxide. Inactive ingredients in mycophenolate mofetil tablets 500 mg include croscarmellose sodium, povidone (K-90), isopropyl alcohol, microcrystalline cellulose, magnesium stearate, hypromellose, polyethylene glycol, titanium dioxide, red iron oxide, black iron oxide, and yellow iron oxide. Negligible amount of drug is excreted as MPA (<1% of dose) in the urine. Orally administered radiolabeled mycophenolate mofetil resulted in complete recovery of the administered dose, with 93% of the administered dose recovered in the urine and 6% recovered in feces. Most (about 87%) of the administered dose is excreted in the urine as MPAG. At clinically encountered concentrations, MPA and MPAG are usually not removed by hemodialysis. However, at high MPAG plasma concentrations (>100 mcg/mL), small amounts of MPAG are removed. Bile acid sequestrants, such as cholestyramine, reduce MPA AUC by interfering with enterohepatic circulation of the drug (see OVERDOSAGE). a AUC0-12h values quoted are extrapolated from data from samples collected over 4 hours. Plasma MPA AUC observed after single-dose (1 g) intravenous dosing to volunteers (n=4) with severe chronic renal impairment (GFR <25 mL/min/1.73 m2) was 62.4 mcg•h/mL (±19.3). Multiple dosing of mycophenolate mofetil in patients with severe chronic renal impairment has not been studied (see PRECAUTIONS: Patients with Renal Impairment and DOSAGE AND ADMINISTRATION). In patients with delayed renal graft function posttransplant, mean MPA AUC0-12h was comparable to that seen in posttransplant patients without delayed renal graft function. There is a potential for a transient increase in the free fraction and concentration of plasma MPA in patients with delayed renal graft function. However, dose adjustment does not appear to be necessary in patients with delayed renal graft function. Mean plasma MPAG AUC0-12h was 2-fold to 3-­fold higher than in posttransplant patients without delayed renal graft function (see PRECAUTIONS: Patients with Renal Impairment and DOSAGE AND ADMINISTRATION). In a single-dose (1 g oral) study of 18 volunteers with alcoholic cirrhosis and 6 healthy volunteers, hepatic MPA glucuronidation processes appeared to be relatively unaffected by hepatic parenchymal disease when pharmacokinetic parameters of healthy volunteers and alcoholic cirrhosis patients within this study were compared. However, it should be noted that for unexplained reasons, the healthy volunteers in this study had about a 50% lower AUC as compared to healthy volunteers in other studies, thus making comparisons between volunteers with alcoholic cirrhosis and healthy volunteers difficult. Effects of hepatic disease on this process probably depend on the particular disease. Hepatic disease with other etiologies, such as primary biliary cirrhosis, may show a different effect. In a single-dose (1 g intravenous) study of 6 volunteers with severe hepatic impairment (aminopyrine breath test less than 0.2% of dose) due to alcoholic cirrhosis, MMF was rapidly converted to MPA. MPA AUC was 44.1 mcg•h/mL (±15.5). Mycophenolate mofetil oral suspension dose of 600 mg/m2 bid (up to a maximum of 1 g bid) achieved mean MPA AUC values in pediatric patients similar to those seen in adult renal transplant patients receiving mycophenolate mofetil capsules at a dose of 1 g bid in the early posttransplant period. There was wide variability in the data. As observed in adults, early posttransplant MPA AUC values were approximately 45% to 53% lower than those observed in the later posttransplant period (>3 months). MPA AUC values were similar in the early and late posttransplant period across the 1 year to 18 year age range. Data obtained from several studies were pooled to look at any gender-related differences in the pharmacokinetics of MPA (data were adjusted to 1 g oral dose). Mean (±SD) MPA AUC0-12h for males (n=79) was 32.0 (±14.5) and for females (n=41) was 36.5 (±18.8) mcg•h/mL while mean (±SD) MPA Cmax was 9.96 (±6.19) in the males and 10.6 (±5.64) mcg/mL in the females. These differences are not of clinical significance. (1) Antithymocyte globulin (ATGAM®) induction/azathioprine/cyclosporine/corticosteroids, (2) Azathioprine/cyclosporine/corticosteroids, and (3) Cyclosporine/corticosteroids. Patients receiving immunosuppressants, including mycophenolate mofetil, are at increased risk of developing bacterial, fungal, protozoal and new or reactivated viral infections, including opportunistic infections. These infections may lead to serious, including fatal outcomes. Because of the danger of over suppression of the immune system which can increase susceptibility to infection, combination immunosuppressant therapy should be used with caution (see ADVERSE REACTIONS). Severe neutropenia [absolute neutrophil count (ANC) <0.5 x 103/mcL] developed in up to 2.0% of renal, up to 2.8% of cardiac, and up to 3.6% of hepatic transplant patients receiving mycophenolate mofetil 3 g daily (see ADVERSE REACTIONS). Patients receiving mycophenolate mofetil should be monitored for neutropenia (see PRECAUTIONS: Laboratory Tests). The development of neutropenia may be related to mycophenolate mofetil itself, concomitant medications, viral infections, or some combination of these causes. If neutropenia develops (ANC <1.3 x 103/mcL), dosing with mycophenolate mofetil should be interrupted or the dose reduced, appropriate diagnostic tests performed, and the patient managed appropriately (see DOSAGE AND ADMINISTRATION). Neutropenia has been observed most frequently in the period from 31 to 180 days posttransplant in patients treated for prevention of renal, cardiac, and hepatic rejection. CAUTION: MYCOPHENOLATE MOFETIL INTRAVENOUS SOLUTION MUST NOT BE ADMINISTERED BY RAPID OR BOLUS INTRAVENOUS INJECTION. In patients with delayed renal graft function posttransplant, mean MPA AUC0-12h was comparable, but MPAG AUC0-12h was 2-fold to 3-fold higher, compared to that seen in posttransplant patients without delayed renal graft function. In the three controlled studies of prevention of renal rejection, there were 298 of 1483 patients (20%) with delayed graft function. Although patients with delayed graft function have a higher incidence of certain adverse events (anemia, thrombocytopenia, hyperkalemia) than patients without delayed graft function, these events were not more frequent in patients receiving mycophenolate mofetil than azathioprine or placebo. No dose adjustment is recommended for these patients; however, they should be carefully observed (see CLINICAL PHARMACOLOGY: Pharmacokinetics and DOSAGE AND ADMINISTRATION). Absorption of a single dose of mycophenolate mofetil (2 g) was decreased when administered to ten rheumatoid arthritis patients also taking Maalox® TC (10 mL qid). The Cmax and AUC0-24h for MPA were 33% and 17% lower, respectively, than when mycophenolate mofetil was administered alone under fasting conditions. Mycophenolate mofetil may be administered to patients who are also taking antacids containing magnesium and aluminum hydroxides; however, it is recommended that mycophenolate mofetil and the antacid not be administered simultaneously. Cyclosporine (Sandimmune®) pharmacokinetics (at doses of 275 to 415 mg/day) were unaffected by single and multiple doses of 1.5 g bid of mycophenolate mofetil in 10 stable renal transplant patients. The mean (±SD) AUC0-12h and Cmax of cyclosporine after 14 days of multiple doses of mycophenolate mofetil were 3290 (±822) ng•h/mL and 753 (±161) ng/mL, respectively, compared to 3245 (±1088) ng•h/mL and 700 (±246) ng/mL, respectively, 1 week before administration of mycophenolate mofetil. Following single-dose administration to 12 stable renal transplant patients, no pharmacokinetic interaction was observed between mycophenolate mofetil (1.5 g) and intravenous ganciclovir (5 mg/kg). Mean (±SD) ganciclovir AUC and Cmax (n=10) were 54.3 (±19.0) mcg•h/mL and 11.5 (±1.8) mcg/mL, respectively, after coadministration of the two drugs, compared to 51.0 (±17.0) mcg•h/ mL and 10.6 (±2.0) mcg/mL, respectively, after administration of intravenous ganciclovir alone. The mean (±SD) AUC and Cmax of MPA (n=12) after coadministration were 80.9 (±21.6) mcg•h/mL and 27.8 (±13.9) mcg/mL, respectively, compared to values of 80.3 (±16.4) mcg•h/mL and 30.9 (±11.2) mcg/mL, respectively, after administration of mycophenolate mofetil alone. Because MPAG plasma concentrations are increased in the presence of renal impairment, as are ganciclovir concentrations, the two drugs will compete for tubular secretion and thus further increases in concentrations of both drugs may occur. In patients with renal impairment in which MMF and ganciclovir or its prodrug (eg, valganciclovir) are coadministered, patients should be monitored carefully. A study of coadministration of mycophenolate mofetil (1 g bid) and combined oral contraceptives containing ethinylestradiol (0.02 mg to 0.04 mg) and levonorgestrel (0.05 mg to 0.20 mg), desogestrel (0.15 mg) or gestodene (0.05 mg to 0.10 mg) was conducted in 18 women with psoriasis over 3 consecutive menstrual cycles. Mean AUC0-24h was similar for ethinylestradiol and 3-keto desogestrel; however, mean levonorgestrel AUC0-24h significantly decreased by about 15%. There was large inter-patient variability (%CV in the range of 60% to 70%) in the data, especially for ethinylestradiol. Mean serum levels of LH, FSH and progesterone were not significantly affected. Mycophenolate mofetil may not have any influence on the ovulation-suppressing action of the studied oral contraceptives. It is recommended to co-administer mycophenolate mofetil with hormonal contraceptives (eg, birth control pill, transdermal patch, vaginal ring, injection, and implant) with caution, and additional barrier contraceptive methods must be used (see PRECAUTIONS: Pregnancy Exposure Prevention and Planning). Following single-dose administration of mycophenolate mofetil (1.5 g) to 12 healthy male volunteers on day 8 of a 10 day course of trimethoprim 160 mg/sulfamethoxazole 800 mg administered bid, no effect on the bioavailability of MPA was observed. The mean (±SD) AUC and Cmax of MPA after concomitant administration were 75.2 (±19.8) mcg•h/mL and 34.0 (±6.6) mcg/mL, respectively, compared to 79.2 (±27.9) mcg•h/mL and 34.2 (±10.7) mcg/mL, respectively, after administration of mycophenolate mofetil alone. Following single-dose administration of mycophenolate mofetil (1 g) to 11 healthy volunteers on day 4 of a 5 day course of a combination of norfloxacin and metronidazole, the mean MPA AUC0-48h was significantly reduced by 33% compared to the administration of mycophenolate mofetil alone (p<0.05). Therefore, mycophenolate mofetil is not recommended to be given with the combination of norfloxacin and metronidazole. There was no significant effect on mean MPA AUC0-48h when mycophenolate mofetil was concomitantly administered with norfloxacin or metronidazole separately. The mean (±SD) MPA AUC0-48h after coadministration of mycophenolate mofetil with norfloxacin or metronidazole separately was 48.3 (±24) mcg•h/mL and 42.7 (±23) mcg•h/mL, respectively, compared with 56.2 (±24) mcg•h/mL after administration of mycophenolate mofetil alone. The genotoxic potential of mycophenolate mofetil was determined in five assays. Mycophenolate mofetil was genotoxic in the mouse lymphoma/thymidine kinase assay and the in vivo mouse micronucleus assay. Mycophenolate mofetil was not genotoxic in bacterial mutation assay, the yeast mitotic gene conversion assay or the Chinese hamster ovary cell chromosomal aberration assay. Based on pharmacokinetic and safety data in pediatric patients after renal transplantation, the recommended dose of mycophenolate mofetil oral suspension is 600 mg/m2 bid (up to a maximum of 1 g bid). Also see CLINICAL PHARMACOLOGY, CLINICAL STUDIES , ADVERSE REACTIONS, and DOSAGE AND ADMINISTRATION. 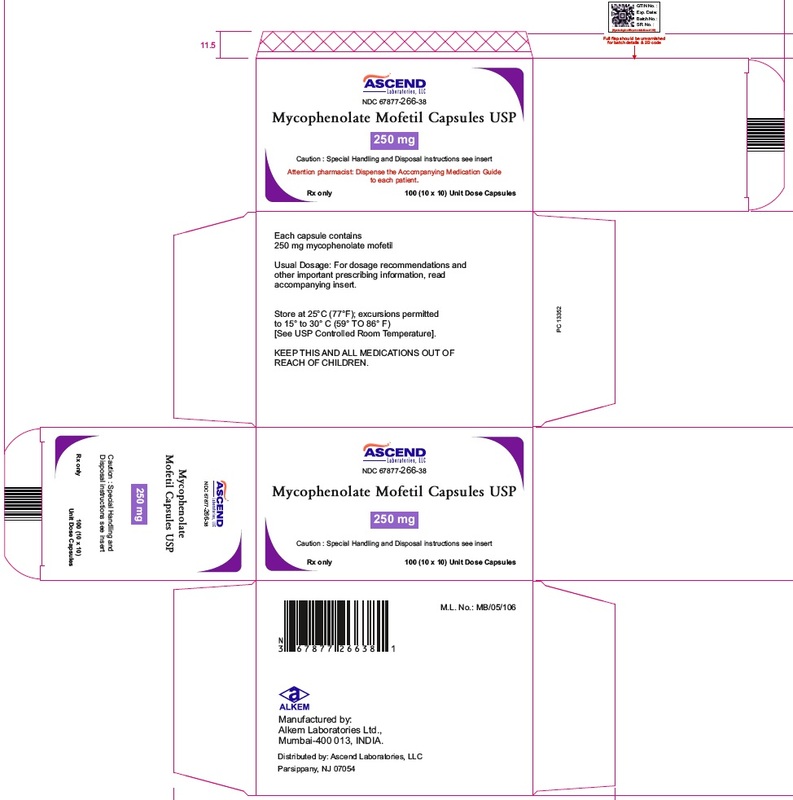 The principal adverse reactions associated with the administration of mycophenolate mofetil include diarrhea, leukopenia, sepsis, vomiting, and there is evidence of a higher frequency of certain types of infections eg, opportunistic infection (see WARNINGS: Serious Infections and WARNINGS: New or Reactivated Viral Infections). The adverse event profile associated with the administration of mycophenolate mofetil Intravenous has been shown to be similar to that observed after administration of oral dosage forms of mycophenolate mofetil. In the digestive system, diarrhea was increased in renal and cardiac transplant patients receiving mycophenolate mofetil to patients receiving azathioprine, but was comparable in hepatic transplant patients treated with mycophenolate mofetil or azathioprine. Severe neutropenia (ANC <0.5 x 103/mcL) developed in up to 2.0% of renal transplant patients, up to 2.8% of cardiac transplant patients and up to 3.6% of hepatic transplant patients receiving mycophenolate mofetil 3 g daily (see WARNINGS: Neutropenia, PRECAUTIONS: Laboratory Tests and DOSAGE AND ADMINISTRATION). The type and frequency of adverse events in a clinical study in 100 pediatric patients 3 months to 18 year of age doses with mycophenolate mofetil oral suspension 600 mg/m2 (up to 1 g bid) were generally similar to those observed in adult patient dosed with mycophenolate mofetil capsules at a dose of 1 g bid with the exception of abdominal pain, fever, infection, pain, sepsis, diarrhea, vomiting, pharingitis, respiratory tract infection, hypertension, leukopenia, and anemia, which were observed in a higher proportion in pediatric patients. Colitis (sometimes caused by cytomegalovirus), pancreatitis, isolated cases of intestinal villous atrophy. Cases of pure red cell aplasia (PRCA) and hypogammaglobulinemia have been reported in patients treated with mycophenolate mofetil in combination with other immunosuppressive agents. • There is evidence of a higher frequency of certain types of serious infections such as tuberculosis and atypical mycobacterial infection. • Cases of progressive multifocal leukoencephalopathy (PML), sometimes fatal, have been reported in patients treated with mycophenolate mofetil. The reported cases generally had risk factors for PML, including treatment with immunosuppressant therapies and impairment of immune function. • Polyomavirus associated neuropathy (PVAN), especially due to BK virus infection, has been observed in patients receiving immunosuppressants, including mycophenolate mofetil. This infection is associated with serious outcomes, including deteriorating renal function and renal graft loss. • Viral reactivation has been reported in patients infected with HBV or HCV. Interstitial lung disorders, including fatal pulmonary fibrosis, have been reported rarely and should be considered in the differential diagnosis of pulmonary symptoms ranging from dyspnea to respiratory failure in posttransplant patients receiving mycophenolate mofetil. MPA and MPAG are usually not removed by hemodialysis. However, at high MPAG plasma concentrations (>100 mcg/mL), small amounts of MPAG are removed. By increasing excretion of the drug, MPA can be removed by bile acid sequestrants, such as cholestyramine (see CLINICAL PHARMACOLOGY: Pharmacokinetics). The recommended dose of mycophenolate mofetil oral suspension is 600 mg/m2 administered twice daily (up to maximum daily dose of 2g/10 mL oral suspension). Patients with a body surface area of 1.25 m2 to 1.5 m2 may be dosed with mycophenolate mofetil capsules at a dose of 750 mg twice daily (1.5 g daily dose). Patients with a body surface area >1.5 m2 may be dosed with mycophenolate mofetil capsules or tablets at a dose of 1 g twice daily (2 g daily dose). Dispense with patient instruction sheet and oral dispensers. It is recommended to write the date of expiration of the constituted suspension on the bottle label. (The shelf-life of the constituted suspension is 60 days.) After constitution the oral suspension contains 200 mg/mL mycophenolate mofetil. Store constituted suspension at 25°C (77°F); excursions permitted to 15° to 30°C (59° to 86°F). Storage in a refrigerator at 2° to 8°C (36° to 46°F) is acceptable. Do not freeze. Discard any unused portion 60 days after constitution. Mycophenolate mofetil Intravenous should not be mixed or administered concurrently via the same infusion catheter with other intravenous drugs or infusion admixtures. If neutropenia develops (ANC <1.3 x 103/mcL), dosing with mycophenolate mofetil should be interrupted or the dose reduced, appropriate diagnostic tests performed, and the patient managed appropriately (see WARNINGS: Neutropenia, ADVERSE REACTIONS, and PRECAUTIONS: Laboratory Tests). Mycophenolate mofetil has demonstrated teratogenic effects in humans (see Pregnancy and WARNINGS: Embryofetal Toxicity). Mycophenolate mofetil tablets should not be crushed and mycophenolate mofetil capsules should not be opened or crushed. Avoid inhalation or direct contact with skin or mucous membranes of the powder contained in mycophenolate mofetil capsules and mycophenolate mofetil oral suspension (before or after constitution). If such contact occurs, wash thoroughly with soap and water; rinse eyes with plain water. Should a spill occur, wipe up using paper towels wetted with water to remove spilled powder or suspension. Caution should be exercised in the handling and preparation of solutions of mycophenolate mofetil intravenous. Avoid direct contact of the prepared solution of mycophenolate mofetil intravenous with skin or mucous membranes. If such contact occurs, wash thoroughly with soap and water; rinse eyes with plain water. Storeat 25°C (77°F); excursions permitted to 15° to30° C (59° TO 86° F) [SeeUSP Controlled Room Temperature].Dispense in a tight light-resistantcontainer, as defined in theUSP with a child resistant cap. Read the Medication Guide that comes with mycophenolate mofetil tablets or capsules before you start taking it and each time you refill your prescription. There may be new information. This Medication Guide does not take the place of talking with your healthcare provider about your medical condition or your treatment. What is the most important information I should know about mycophenolate mofetil ? Viral infections.Certain viruses can live in your body and cause active infections when your immune system is weak. Viral infections that can happen with mycophenolate mofetil include. What is mycophenolate mofetil tablet or capsule? Mycophenolate mofetil tablet or capsule is a prescription medicine to prevent rejection (antirejection medicine) in people who have received a kidney, heart or liver transplant. Rejection is when the body’s immune system perceives the new organ as a “foreign” threat and attacks it. Mycophenolate mofetil is used with other medicines called cyclosporines (Sandimmune®, Gengraf®, Neoral®) and corticosteroids. Do not take mycophenolate mofetil if you are allergic to mycophenolate mofetil or any of the ingredients in mycophenolate mofetil tablets or capsules. See the end of this Medication Guide for a complete list of ingredients in mycophenolate mofetil tablets or capsules. 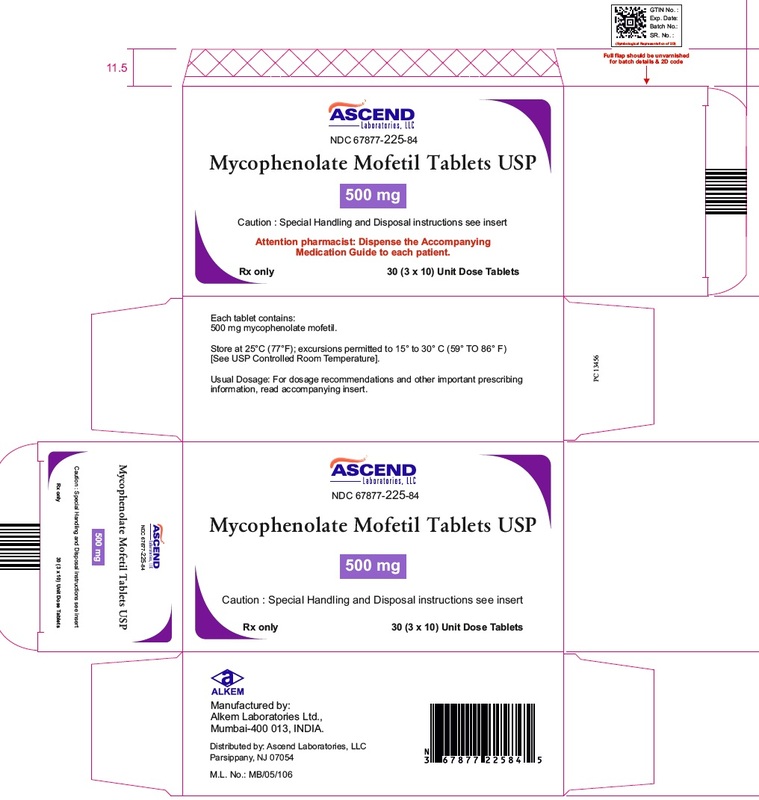 Store mycophenolate mofetil tablets or capsules at room temperature, between 59° to 86°F (15° to 30°C). Keep the container closed tightly. This Medication Guide summarizes the most important information about mycophenolate mofetil. If you would like more information, talk with your doctor. You can ask your doctor or pharmacist for information about mycophenolate mofetil that is written for healthcare professionals. Mycophenolate Mofetil Capsules USP 250 mg : croscarmellose sodium, pregelatinized starch, povidone (K-90), isopropyl alcohol, and magnesium stearate. The capsule shells contain gelatin, sodium lauryl sulphate, FD&C blue 2, red iron oxide, yellow iron oxide, and titanium dioxide. The capsule is printed with edible black ink comprised of shellac, dehydrated alcohol, isopropyl alcohol, butyl alcohol, propylene glycol, strong ammonia solution, black iron oxide, and potassium hydroxide. Mycophenolate Mofetil Tablets USP 500 mg : croscarmellose sodium, povidone (K-90), isopropyl alcohol, microcrystalline cellulose, magnesium stearate, hypromellose, polyethylene glycol, titanium dioxide, red iron oxide, black iron oxide, and yellow iron oxide. Caution: Special Handling and Disposal instructions see insert.